Franklin Delano Weatherly, 69, of Clute, Texas passed away on March 26, 2018. Frank was born November 20, 1948 in Refugio, Texas and was the eighth of ten children born to Noel Emmitt and Jesse Othallo Larsh Weatherly. He grew up playing in the great outdoors with friends, siblings, nieces and nephews. He did miscellaneous odd jobs for people and even shined shoes at the courthouse for spending money. 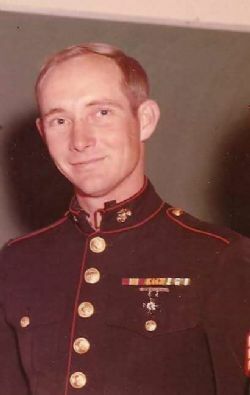 He joined the Army in 1966 then was in the United States Marine Corp from 1970 to 1974. He was very proud to serve his country in both Europe and Viet Nam. He met the love of his life, Carolyn Hodel, while stationed at Camp Pendleton, California. They were married in December of 1972 and had their first daughter, Michelle, in 1975. They moved to Texas in 1976 and had their second daughter, Tara, in 1978. While working for I.C.S. Frank attended Brazosport College and got his degree in Commercial and Industrial Carpentry. He later worked for U.S. Contractors and A-Z Masonry before going to work at the V.A. Medical Center in Houston. He retired in 2000 due to health issues. Frank loved his and family and especially loved spending time with his three grandchildren. He enjoyed fishing with his best friend Danny Byrd and teaching his nephews how to gig flounder at Christmas Bay. His last few years were spent traveling with his wife, Carolyn, to Washington State. They also went on a romantic get-a-way to Catalina Island, California before meeting up to share Disneyland and Knott’s Berry Farm with Michelle, husband Diego, and the three grandchildren. Trips always included visits to family that have become cherished memories. Frank was diagnosed with cancer in 2015. He fought very hard to be able to be strong and give his younger daughter, Tara, away at her wedding to Terry in San Antonio in November 2017. Frank was preceded in death by his baby son, Franklin D. Weatherly, Jr.; parents Noel E. and Jesse Weatherly; brothers Noel (Red) and Theodore Murphy Weatherly; sisters Betty Rodd, Vesta Louise Brogdon and Jesse (Peanut) McLeister. He is survived by his wife of 45 years, Carolyn Joy Weatherly; daughters Michelle (Diego) Molinari and Tara Marie (Terry) McMahan; grandchildren Sebastian, Enzo and Gianna Lily Molinari; brother Charles (Donna) Weatherly; sisters Susie Taylor, Cynthia Brown and Shirley (Dennis) Reese; also numerous nephews and nieces, many of whom are near his age due to his large family. A funeral service and celebration of his life will be on Saturday, March 31, 2018 at Lakewood Funeral Chapel, Lake Jackson at 4:30 p.m. with pastor Josh McGee of Clute First Baptist Church officiating. The service will also include military honors. A reception in an adjoining room will follow the service.